« Gulf Oil Spill — Not My Problem? There\’s plenty of variety in cargo bikes. As the Age of Human-Powered Vehicles comes to pass, we are seeing more utility bikes being used for around-town errands. Many utility bikes are tricycles. I have fond memories of going for a pedicab ride in Kanchanaburi, Thailand. The owner let me try out his pedicab. It was hard going! In the Philippines, sidecars are popular. However, there are quite a few two-wheel cargo bikes. They’re designed to carry bulky loads that would be difficult to manage by someone riding a standard two-wheeler. Of course, we have all seen images of cyclists carrying immense loads on standard two-wheel bikes, so a cargo bike would be a luxury in some parts of the world. Cargo bikes follow four basic styles: modified traditional, low-gravity, the Longjohn, and the Longtail. The Royal Enfield low-gravity carrier bike was popular in the 1930s. It has a smaller front wheel and a front basket. The Longjohn also has a smaller front wheel than the rear, but it has a large basket low to the ground between the front wheel and handlebars. The Longtail is a longer bike with thicker tires and more room in the rear for a rack. Specialized, a trendsetter in the bike industry, now offers a utility bike. I recently rode a “performance” cargo bike similar to the Royal Enfield style, built by Dale Saso of San Jose, California. Dale has been building cargo bikes for 25 years. He makes his cargo bikes with quality, lightweight tubing. His personal bike, which I rode, has high-end components. Picasa has more photos of Dale’s bike. The ride takes getting used to, as is true for any bike. Because the basket covers the front wheel, you lose your frame of reference. The wheel turns independently of the basket. What’s interesting is that as more weight was added to the basket, I found the ride became more stable. 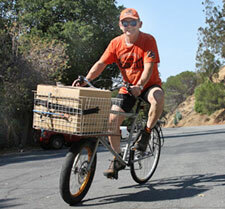 Dale Saso rides his cargo bike. Dale’s cargo bike is in a league of its own. Most cargo bikes, such as the Longjohn, are less nimble and will give a completely different ride. What’s unique about Dale’s cargo bike is the front wheel, which has a 20-inch rim and 3-inch tires, found on electric motorbikes. It gives the bike increased stability. Dale says his cargo bike design continues to evolve. He’s working on a handy quick-release for the cantilever style carrier (bolting to the down tube and head tube) that holds the basket. This entry was posted on June 1, 2010 at 2:58 am and is filed under Products. You can follow any responses to this entry through the RSS 2.0 feed. You can leave a response, or trackback from your own site.